What?? 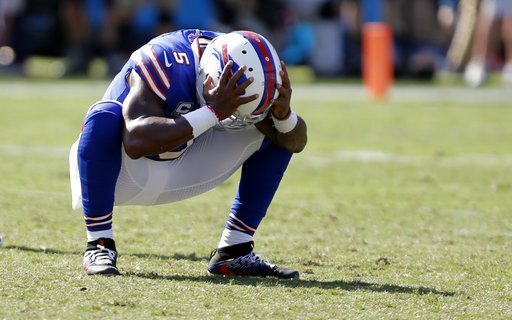 Wait, what did the Bills just get for Tyrod Taylor?? I was shocked when I heard the news, reported first on Friday night by ESPN. The fact that I was in Cleveland covering the UB Bulls in the MAC Tournament made it even more surreal. I didn’t dare say it too loud around this city’s Browns fans, because the I-90 robbery might have made them take it out on me. It’s not a surprise that the Bills traded Taylor. They were done with him the minute they decided to start Nathan Peterman in Los Angeles. But the rest of the NFL knew that, and also knew that trading Taylor would save the Bills $10 million on the salary cap. I’m surprised at what they got for him. To get a 3rd round pick, that’s the first pick of the round, is an amazing haul for Bills GM Brandon Beane. That replaces the third round pick the Bills traded for Kelvin Benjamin, and now gives them six picks in the first three rounds. Trading him now, and making the Browns pick up Taylor’s $6 million dollar roster bonus is also a coup for the Bills. Any team, including the Browns, could have waited and made the Bills pick up the option and then make the trade. So why would the Browns do this? They also traded DeShone Kizer to Green Bay in a flurry of reported trades on Friday. An NFL source told me he likes the trade, and it makes sense for the Browns, because they now get a solid NFL backup/placeholder starter for a reasonable $16 million dollar cap hit. The trade for Taylor does not prevent the Browns from drafting a quarterback with the first or fourth picks in the first round. Now they have a solid veteran who can hold the position and teach Sam Darnold or Josh Rosen the ropes. Good. Not good enough. That’s my thoughts on the legacy of Tyrod. He helped the Bills end the playoff drought, and that will always make him a hero in WNY. But he struggled to be a real NFL quarterback, one who can stand in the pocket and throw the ball downfield. That’s how you win the NFL, not with a running quarterback. So the Bills are left with just Peterman at QB. Obviously, more players will be added in free agency and the draft. I suspect the Bills will focus on the draft, now that they have more ammunition to trade up and get their guy. A veteran in free agency could be an option. Or maybe a short-term starter like Sam Bradford. We’ll find out when free agency starts on Wednesday.